What do you do when your soul mate marries your best friend? If you’re Kate Evans, you keep your friend Rachel, bond with her kids, and bury your feelings for her husband. The fact that Shane’s in the military and away for long periods helps-but when tragedy strikes, everything changes. After Rachel, pregnant with her fourth child, dies in a car accident and the baby miraculously survives, Kate upends her entire life to share parenting duties. Then on the first anniversary of Rachel’s death, Kate and Shane take comfort in each other in a night that they both soon regret. Shane’s been angry for a year, and now he feels guilty too – for sleeping with his wife’s best friend and liking it…liking her. Kate’s ability to read him like a book may have once sent Shane running, but their lives are forever entwined and they are growing closer. I don’t remember the drive to the hospital or even where I parked that afternoon. I can’t recall what the nurse looked like as she searched for Rachel’s name in their computer system or the walk toward the room where I waited for someone to speak to me.The first thing I remember clearly is the white-haired doctor’s kind face as he sat down across from me, and the young chaplain’s small smile as he chose the chair to my left. Their words became a litany that I would hear in my dreams for years. 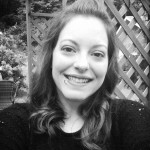 My Rachel was gone, but her son was alive and in the NICU. The question jolted me out of the fog that seemed to be getting thicker and thicker around me. Dear God. The room was silent after they left, and I fought the urge to scream at the top of my lungs just to hear it echo around me. I understood then why people hired mourners to wail at funerals. Sometimes the lack of sound is more painful than the anguished noise of a heart breaking. My hands shook as I pulled my phone out of my front pocket and rested it on the table in front of me. It only took a moment before the sound of ringing filled the room, and I rested my head in my hands as I stared at the name across the screen. “Shane—” I said quietly, my voice hitching. “What? Why are you calling me?” His voice was confused, but I could hear a small thread of panic in the urgency of his words. “I need you to come to Tri-City Hospital,” I answered, tears rolling down my face and landing on the glass screen of my phone, distorting the letters and numbers. “Who?” His voice was frantic, and I could hear him moving around, his breathing heavy. “Rachel was in an accident.” I sobbed, covering my face to try and muffle the noise. I shook my head, trying to catch my breath. “Kate! Is she okay?” He screamed at me, his anguished voice filling the room as I’d wanted mine to just minutes before. He didn’t say a word, and less than a second later, the connection was broken. I made my way to the NICU as quickly as I could, and within minutes, I was holding my new nephew in my arms. The nurses told me that he’d passed all of his tests with flying colors, and I was in awe as I sat down in a rocking chair, cradling him to my chest. I sniffled, closing my eyes as tears rolled down my cheeks. My whole body ached, and even though I had that little boy in my arms, the whole day seemed like some sort of surreal dream, foggy in some parts and crystal clear in others. I wanted to hop up and take his sleeping, little form to Rachel, to tease her about the weird Mohawk thing he was sporting and make joking comments about how men always seem to sleep through the hard parts of life. I wanted to see her smile proudly at the sturdy boy she’d produced and grumble that I was hogging him. I wanted everything to be different. I hummed softly with my eyes closed for a long time, holding the baby close to me. It was quiet where we sat, nothing breaking up the stillness of the room until I heard someone open the door. “There he is,” the nurse murmured from the doorway. My eyes popped open to see Shane’s ravaged face just feet from me. He looked like he was barely holding on. I swallowed hard as his red rimmed eyes took in his son carefully before rising to meet mine. “Is he okay?” he asked thickly, searching my face. I’d never seen him so frightened. He nodded twice, reaching up to cover his mouth with his hand, but before he could say another word, he was stumbling and falling to his knees with an almost inaudible sob. DGR: What was your favorite scene to write in Unbreak My Heart and what is your favorite scene to read in Unbreak My Heart? NJ: My favorite scene to write was probably the scene when Kate is singing to the kids over the phone. She was devastated but pulled it together to get her kids to sleep from a thousand miles away. That’s such a mom thing to do. My favorite scene to read is when Shane is taking the kids back to California and Keller decides that he’s going to stay behind. He comes across as a bit of a brat in this story, but when the chips are down he’s worried about who’s going to be taking care of Kate. That’s Keller. He might not get his point across in a constructive way, but he feels things very deeply. What can I say? I like the ones that seem to punch you right in the belly. I’d pushed her aside for so long that there was no foundation to build on. Just a mess of shattered pieces that I’d crushed with a sledgehammer every time she’d grown closer than I was comfortable with. God. GOD. This book. This heartbreaking, incredibly written, gut wrenching book. If it had any more of my favorite elements in it, I’d feel like it was custom written for me. I don’t remember the last time I read a book that gripped me the way this one did. To the point that I felt it on a visceral level. To the point that now days later after finishing it, I still can’t stop thinking about it. This was easily one of my top favorite reads this year. I picked it up and read it straight through because I couldn’t bear to put it down for even a second. I was an ugly crying, sniveling, raging mess the entire time and loved every painful second of it. If The Unwanted Wife and Walk Through Fire had an angst baby, this book would be IT. I’m so book hungover right now, I can’t even form words. 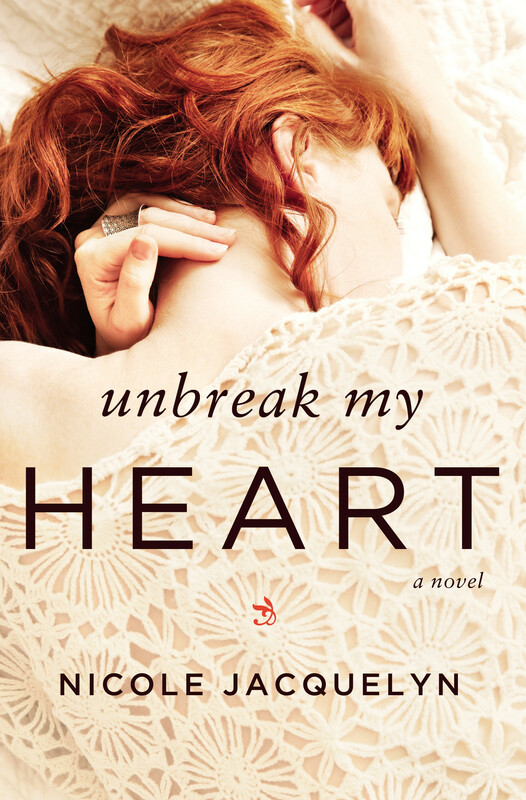 Unbreak My Heart is an unbelievably gripping story of love and loss and second chances. This book absolutely owned my heart. It was a compelling, angst-filled, emotional, and completely unputdownable read from beginning to finish. You will love to hate this hero and then you’ll just flat out love him. 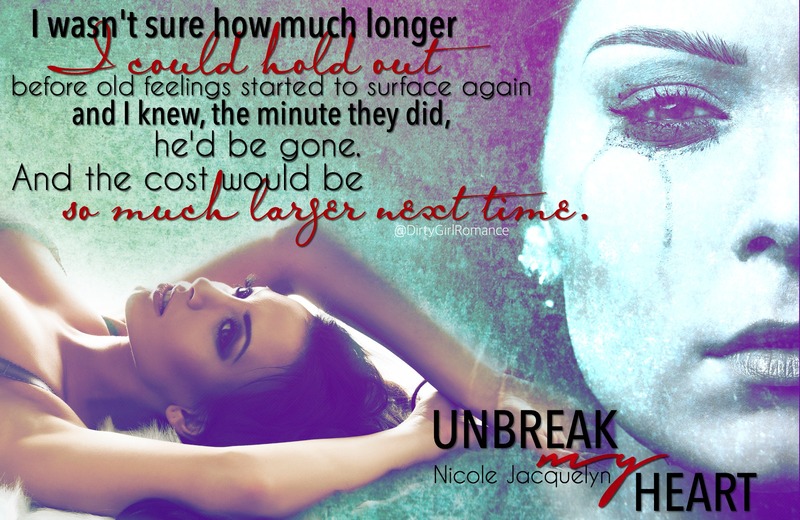 Nicole Jacquelyn has a true gift with words because her characters are so incredibly compelling, you don’t just read about them, you experience them. There is not an ounce of telling in this book. Everything is shown, including the character descriptions. Yeah. I was blown away to say the least. Shane is not an easy hero to love. As a matter of fact he will make you down right hate him. He will break your heart so many times over, you’ll wonder if there is a road back. But there is. Oh but there is. I didn’t know how to be with someone like Kate. She’d demand more from me than anyone ever had before, and that was terrifying. You may be asking yourself if it’s possible to write a book with a dead spouse and not make the heroine feel like a consolation prize prize. And to you I say, abso-freaking-lutely. Kate is a character with so much depth. She takes so much emotional punishment throughout this book that you want to say that she may be too forgiving. But the author instills so much growth in her throughout the story that you’ll love her more and more with each page. I won’t give you anything about the plot, because to be quite honest, everything you need to know is in the blurb. Anything more than that will be a spoiler. And if there’s one thing I can recommend is to go into this book absolutely blind with NO preconceived notions. I couldn’t change the past, but hell if I didn’t want to be what Kate needed now. Everything about this story is brilliant; from the feelings it will wrench from your very soul to the emotional mess it will leave you at the end of it. Shane and Kate’s story is not an easy one. It’s filled with pain and heart break but it’s also beautiful in its own right. You don’t read the characters’ journey, you experience it. Everything from the fundamental changes in their relationship to their feelings and everything in between. For the past couple of nights when I’d lain down beside her, after she’d called asleep and I knew she couldn’t hear me, I’d promised her that she’d never have to forgive me again if she could do it one last time. If you’re questioning picking this up, don’t! If you’re a fellow angst-whore like me, if there’s one book I can recommend you read, it’s this one! Grab some tissues and some alcohol and prepare to read the whole night through because I guarantee this book will own every piece of you by the time you’re finished. When Nicole Jacquelyn was eight and people asked what she wanted to be when she grew up, she told them she wanted to be a mom. When she was 12, her answer changed to author. Her dreams stayed constant. First, she became a mom, and then during her senior year of college–with one daughter in first grade and the other in preschool–she sat down and wrote a story.